Karina's Kreations: Lady Bug Box! This is a cute box that uses the Box #2 Bigz XL die and the Big Shot Die Cut Machine. The card stock colors are Certainly Celery, Real Red and Basic Black. The tulips from Garden Whimsy stamp set were stamped with Real Red Ink on Certainly Celery card stock. A 1/2" strip of Basic Black card stock was run through the Crimper tool and attached to the Box. 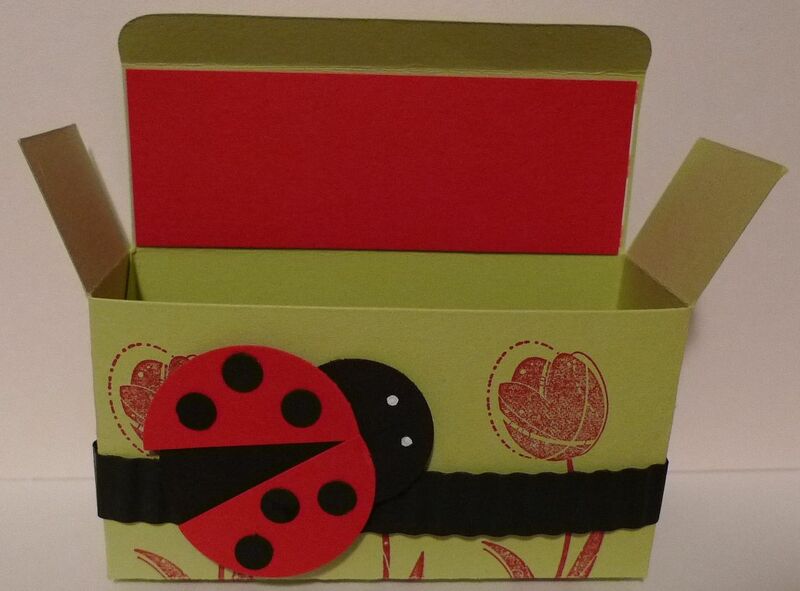 The lady bug was made with 1-3/8" circle punch, 1" circle punch and 1/4" circle punch. A Uni-ball Signo Gel pen was used to make the eyes of the lady bug.